Anyone reading yesterday knows today's the day the Amazon Kindle finally launches, and we're live from their big (little) launch event in New York. There are maybe a hundred fifty seats (and people are still filing in), so we'll be getting started here in just a few. Just the usual pre-event mingling. Surprising this place hasn't filled up any faster. All the event handlers have very austere looks on their faces, as though they're cramming for a really difficult exam, or launching an e-book reader. 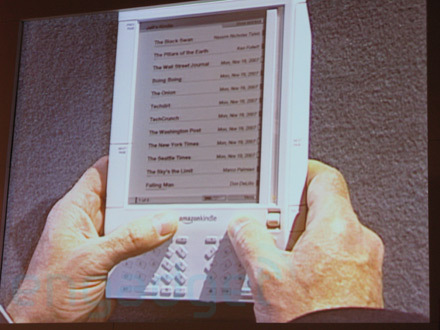 We got the first picture of the Kindle! There she is. That angle up towards the left is really severe, this thing is far from flat. Announcer: "We're getting started in just a few minutes..." More after the break. The cool jazz is killing us here, man. Let's get going! 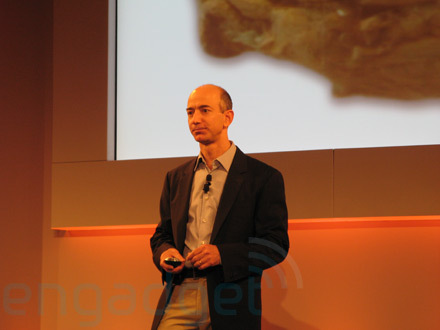 9:41AM ET - Jeff Bezos! He's discussing the history of text... every thousand years there's a paradigm shift in reading. "We forget that this is a technology... but books are a technology. And the process for making them is a very sophisticated technology." "... The printing press has gotten a lot more sophisticated since Gutenberg's time... Gutenberg would still recognize a modern day book." 9:46 - "The interesting question to think about is why are books the last bastion of analog? They've stubbornly resisted digitization. ... the key feature to a book is that it disappears as we read it. We don't think about the ink or the paper or the glue or the stitching, all those things go away. What remains is the author's world, the author's words..."
9:47 - He's talking about his childhood experiences -- he was a book nerd and apparently was all totally into teletype. You go, Jeff. "Can you improve on something as highly evolved and well suited to its task as a book? If you're going to build a purpose-built reading device it has to get out of the way so you can enjoy your reading." "We knew we could never out-book the book." 9:50 - "You can't duplicate a real book store online..." He's explaining that you have to play to your medium. Customer reviews, recommendations -- things you can do on Amazon that you can't do in a physical store. "We can't out-book the book, but could use this new medium to go beyond... 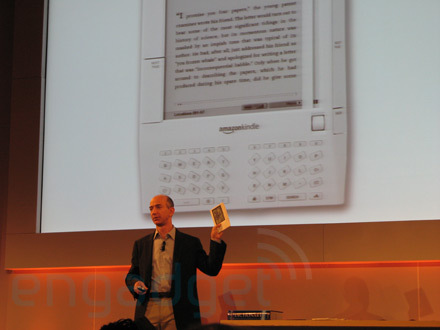 I'm proud after 3 years of development to announce the Amazon Kindle. 9:51 - "We studied how people hold books." He's talking about the traditional device experience -- install software, shop from the PC, use a USB cable to sync contents. "But we didn't think that was a very good solution, so we decided there would be NO PC. No software to install. ... The store is on the device, and the content is wirelessly and seamlessly delivered to the device. 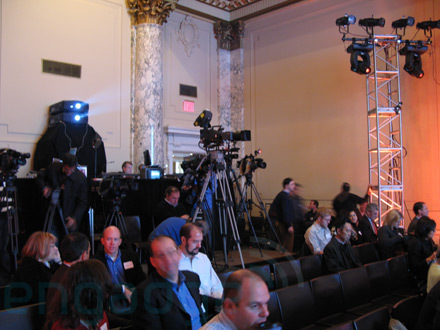 Now, if you're going to deliver content wirelessly, you have to use a wireless solution." He's going over the difficulties of using WiFi. Yes, we know Jeff, we heard the thing was using EV-DO. 9:55 - "We didn't like this solution either. So instead we chose EV-DO cellular. ... as soon as I tell you we're using EV-DO that should cause a second set of concerns, a whole new thing to worry about. Everybody knows that using these wireless cell networks there's a data plan, a contract, a monthly bill. But we didn't like that, either. So we built Amazon Whispernet. It's built on top of Sprint's EV-DO network. There's no data plan, no contract, no bill. We pay for all of that behind the scenes so you can just read. What are you going to read?" 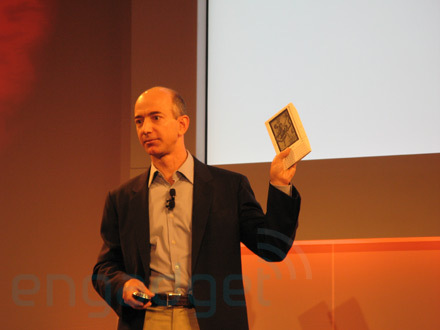 9:57 - "We have 90,000 books that you can buy right from the device and have wirelessly delivered. And these are books people want to read, including 101 of the 112 NYT bestsellers. NYT bestsellers and new releases are just $9.99, and are delivered in just a minute. Why not include newspapers? Newspapers are delivered automatically while you sleep; and these are newspapers you've heard of, WSJ, NYT, Washington Post, and local newspapers too." 9:59 - "Time, Fortune, even blogs. Over 300 of your favorite blogs are available. Subscribe to the blogs you want and they're updated continuously throughout the day. ...HuffPost, The Onion..." Every Kindle has an email address, attach your personal docs, email them to the device, and they're wirelessly delivered to the device. Word docs, JPEGs, "It's a pretty cool feature. There's a resident dictionary on this device." He's discussing dictionaries and using the built-in dict, which is supposed to be pretty easy. 10:02 - "If you were to print Wikipedia you'd need two miles of shelves. 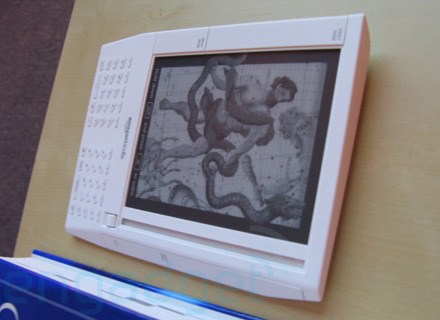 You can access Wikipedia from this device, so you have not only a dictionary but the world's greatest encyclopedia. What do you get? The most advanced EV-DO in the world, the most advanced display tech in the world, no commitment, no contract, no service payments, and I'm excited to tell you it's on sale right now for $399." Uh oh, it's video time. "We decided to give Kindles for a few weeks to some of the toughest customers we can imagine..." Clip time. 10:05 - "It's so simple you could be a moron and it works." Um, thanks video clip guy. It's got two switches: on / off, and radio on / off. It's got a USB port on the bottom, as well as a 3.5mm jack. Yeah, more and more video, recap of the same stuff we've already heard from Bezos this AM, but just said by other people, primarily authors. 10:14 - Ok, this video has gone on about 10 minutes too long. Demo time! You can change the font size. 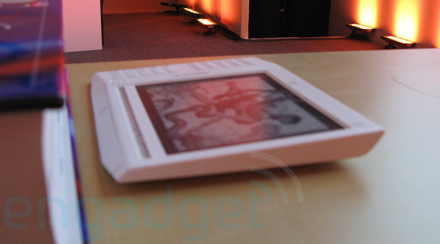 The side-selector appears to be LCD-based, not e-ink based. 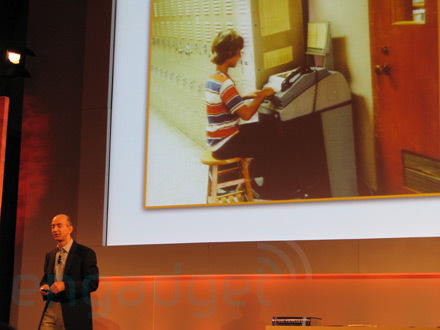 Notes and annotations are saved to the cloud, "so you can never lose anything." 10:21 - There's a cancel this order feature that allows you to reverse a just-purchased book in case you grabbed it accidentally. 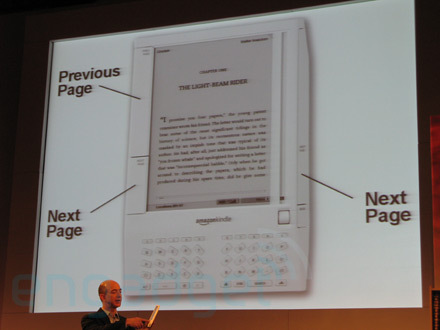 It automatically bookmarks your last page read (like most e-book readers). "We archive your books in the cloud. If you ever lose a book, you can just redownload it again, it doesn't cost anything. If you want to clear out space on your Kindle knowing they're secure on the server, and in 60 seconds you can get it back again. 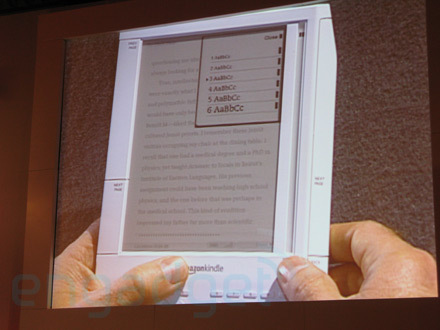 But the most important thing about Kindle, is that it does indeed disappear so that you can enter the author's world. Thank you." Applause, and we're done!